BNP Paribas was glad to support the event Finance for a Sustainable Future held at the Schebek Palace, in the Prague old town. From 29 to 31 August 2018, 30 young talented professionals, from various European countries, attended lectures by experts in sustainable finance, impact investing and ESG. This event was unique as it was the first conference on those subjects for young professionals. On the 30th of August, BNP Paribas Corporate and Institutional Banking hosted a networking lunch for all the participants and Daniel Macoun, Senior Relationship Manager, explained how the bank has implemented sustainability in its day-to-day activities. He described the application of the 9 CSR policies, before financing a project or a company linked to a sensitive sector. In 2017, the BNP Paribas CSR team reviewed 831 transactions to ensure their compliance with these policies or other CIB CSR frameworks. 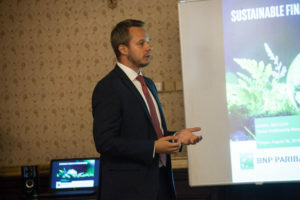 Daniel Macoun also talked about the innovative green finance products and solutions BNP Paribas develops for or co-creates with its clients (e.i. : positive incentive loans, green bonds…). We would like to thank the Finance-for-a-Sustainable-Future organisation team for its professionalism and involvement making this event a great success.